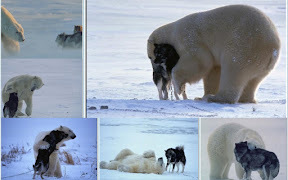 A photographer in Alaska was out with his dog, shown here, when suddenly a polar bear came onto the scene. In spite of his own trepidations, the photographer kept his camera clicking and was amazed to discover not only acceptance by both parties, but kinship and play. If two such strange new friends can get along......two potential adversaries......with totally different agendas.......can get along at first encounter without judgment, criticism, anger or fear......what's wrong with the rest of us? That is a very good question. What a wonderful picture. Reminds me of the Staffordshire Terrier, aka Pit Bull, I had while living in NY. While walking her we saw a little bird that couldn't fly, and she just nudged the bird with her nose, and stood over it. She didn't want to leave that bird.